TOOLS: C# using Microsoft Visual Studio .NET and the GDI+ graphics API. GOAL: Use one or more data sets and other pieces of information to create an interactive data exploration and visualization project. 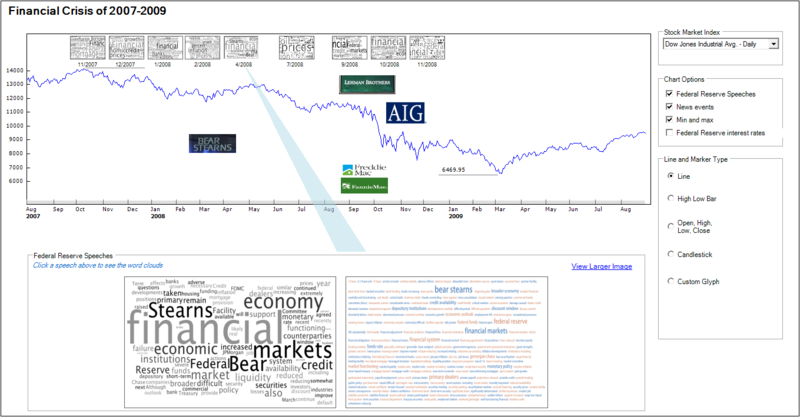 RESULT: Stock Market Visual Explorer is an interactive data visualization Windows-based program that shows the decline of the stock market during 2007 to 2008. The application displays the Dow Jones Industrial average and ties the data together with Federal Reserve speeches that were given during that time period. You can click on a speech and display an image of a word cloud for the selected speech. The word clouds are screenshots of the visualizations that I created using the IBM Many Eyes and Wordle.net web sites. You can also choose different glyphs to draw the stock market trace and can also change time period between daily, weekly, monthly. The visualization also shows the min and max values of the Dow Jones Industrial average. You can also display news events that show the different companies that had financial struggles or went bankrupt over the time period.